Elizabeth watched Mr. Lincoln court and mourn neighbor Anne Rutledge. “I never seen a man mourn for a companion more than he did for her.”5 Mr. Lincoln told her one rainy day that he could not bear the thought of rain falling on Anne’ grave. Mr. Lincoln’s next serious female relationship was with Elizabeth’s sister Mary, whom Mrs. Abell was very interested in matching with Mr. Lincoln. Mrs. Abell later wrote that Mr. Lincoln wanted Mary Owns “to consider and reconsider it that he was poore.” She added “what man on earth would have done such a thing but Abraham Lincoln he was two honest a man for this world.”19 Mary Owens left New Salem in late 1838 and ceased any correspondence with Mr. Lincoln. Although some of his letters to her survive, none of those from her to Mr. Lincoln do. 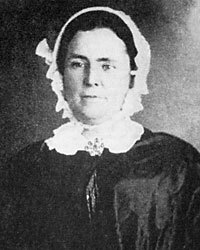 She married Jesse Vineyard about 1842 and moved to Missouri. Her sons joined the Confederate army. Douglas L. Wilson and Rodney O. Davis, editor, Herndon’s Informants, p. 556 (Letter from Elizabeth Abell to William H. Herndon, February 15, 1867). Michael Burlingame, editor, An Oral History of Abraham Lincoln, John G. Nicolay’s Interviews and Essays, p. 19 (Conversation with William Butler, June 13, 1875). Douglas L. Wilson and Rodney O. Davis, editor, Herndon’s Informants, p. 256 (Letter from Mary S. Vineyard, May 23, 1866). Douglas L. Wilson and Rodney O. Davis, editor, Herndon’s Informants, (Interview with Johnson Gaines Greene, 1866). Douglas L. Wilson and Rodney O. Davis, editor, Herndon’s Informants, p. 243 (Interview with Mentor Graham, April 2,1866). Douglas L. Wilson and Rodney O. Davis, editor, Herndon’s Informants, p. 250 (Letter from Lynn M. Greene to William H. Herndon, May 3, 1866). Douglas L. Wilson and Rodney O. Davis, editor, Herndon’s Informants, p. 610 (Letter from Benjamin R. Vineyard to Jesse W. Weik, March 14, 1887). Roy P. Basler, editor, The Collected Works of Abraham Lincoln, Volume I, p. 117 (Letter to Mrs. Orville H. Browning, April 1, 1838). Roy P. Basler, editor, The Collected Works of Abraham Lincoln, Volume I, p. 118 (Letter to Mrs. Orville H. Browning, April 1, 1838). Douglas L. Wilson and Rodney O. Davis, editor, Herndon’s Informants, p. 256 (Letter from Mary S. Vineyard to William H. Herndon, May 23, 1866). Douglas L. Wilson and Rodney O. Davis, editor, Herndon’s Informants, p. 262 (Letter from Mary S. Vineyard to William H. Herndon, July 22, 1866). Douglas L. Wilson and Rodney O. Davis, editor, Herndon’s Informants, p. 530-531 (Johnson Gaines Greene interview with William H. Herndon, 1866). Roy P. Basler, editor, The Collected Works of Abraham Lincoln, Volume I, p. 54-55 (Letter to Mary S. Owens, December 13, 1836). Roy P. Basler, editor, The Collected Works of Abraham Lincoln, p. 78-79 (Letter to Mary S. Owens, May 7, 1837). Douglas L. Wilson and Rodney O. Davis, editor, Herndon’s Informants, p. 544 (Letter from Elizabeth Abell to William H. Herndon, January 13, 1867).